With the arrival of the new Mini NES console, people all over will be able to play classic NES games from their youth or, in some cases, for the first time ever. One of the games contained on the console is Zelda II: The Adventure of Link, a game which I feel is unfairly criticized online for its crushing difficulty and the admittedly different direction the game takes compared to the rest of the series. With this walkthrough, I am going to try to give newcomers an edge and take them through the game in a way that hopefully cuts the difficulty down dramatically. Even if you're not a newcomer to the game, this guide might help you enjoy the game a bit more. 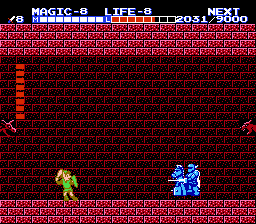 We begin the game in the Northern Palace in front of a sleeping Princess Zelda. Head out of here by either going right or left and you'll appear on the overworld. On the overworld there are a few things to watch out for. Take a look at this screenshot to the right. 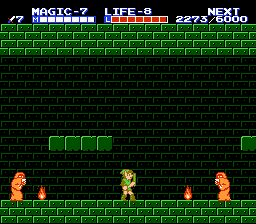 Link is positioned in the center of the screen, and surrounding him are three shadowy enemies. The ones above and below him are weak enemies and look like the shadow of a Bot enemy, while the one to the right looks similar to Ganon and is a strong enemy. If Link is standing on a road, enemies will not attack him. If enemies are surrounding you and you step onto the road and then engage in combat, Link will be able to safely walk off of the battle scene with no conflict. Additionally, next to the road is a town tile. Stepping onto it will enter the town and change the view to a side scrolling one. 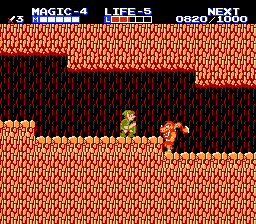 To the right is a cave, which in the beginning of the game is almost pitch black until you recover the Candle. Caves are sometimes home to valuable treasure, but they are always home to tough enemies. Tiles you're standing on when you're attacked will affect the landscape of the battle. 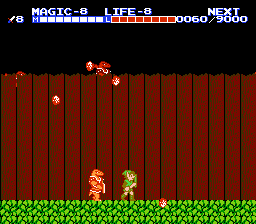 In this screenshot, Link is getting attacked in a forest, so his side scrolling battle will take place there. Other locations are plains, desert, swamp, cemetery, and lava. When you leave the Northern Palace, you'll see a road leading from it. As soon as you can, head south to the mountains and follow them west until you find a cave in the wall. When you enter it, you'll see a lot of black and a little navy blue. Since you don't have the Candle yet, the caves you enter will still be shrouded in darkness. Fortunately this cave is no sweat, so head right. Pay attention to the ground. There are two Lowder beetles scurrying across the cave floor, and you can see them by paying attention to the ground. Enemies are set to walk one row of pixels below the top of the floor tiles, so you can see a disturbance along the ground where enemies are. When you see them coming at you, crouch and stab with your sword until they're dead. After killing the two Lowders, ahead just a bit more is a third one. Defeat it as you did the others and proceed through the cave. You'll come to three indentions in the ground, and when you see them, duck. Flickering projectiles will start heading your way, but you are able to block them with your shield by ducking. Inside each of the three indentions are an Octorok. Crouch next to the indention and swing your sword and they'll eventually leap up into your attack and be defeated. Past all of this is a ledge with a Magic Container, the first of four. Head left back out of the cave. Go north from the cave through the plains and forest until you reach the road. Any enemy encounters you may have through here, be sure to fight every enemy. You never know when a Bot that would normally give you 2 experience points will suddenly drop a P-Bag worth 50. At this point in the game, 50 experience is a significant chunk of change. Follow the road east until you come to a lone forest tile in a plains. Step onto it and you'll enter a hidden grotto with a 50 point P-Bag. Pick up the P-Bag by striking it with your sword. Beware of the Ache bats looming in the treetops. They'll swoop down at you when you get near. By this point you will gain a level. You are given the option to raise one level in Life or you can cancel. Gain your level in Life, and then exit this secret grotto and you'll be back on the overworld. There are reasons to cancel a level gain that I don't necessarily agree with, so I would suggest to you to never cancel one, though you can if you'd like. For this guide I won't be cancelling any level gains. The Attack stat is the one that is the hardest to level, followed by Magic, and then Life. The concept behind cancelling is to increase your Attack stat faster earlier in the game so you can deal more damage. This sounds good, and in many ways it is, but for a new player I wouldn't suggest doing it. 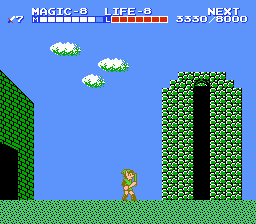 Your Life stat will suffer for it, and if this is your first time going through Zelda II, then you're going to be taking a lot of damage. There's no reason to take even more just so you can deal a bit more damage early on. It'll all balance out in the end. Continue following the road to the right and you'll come across a town. A boulder is blocking the path next to it. "Return the crystal to the palace in Parapa." This refers to your quest of placing the crystals back in the totems at the end of each palace. Parapa is the desert on the other side of the cave you're about to enter and it's where the first palace is located. "When all else fails, use fire." What this is talking about is the fact that there are some enemies in the game that you cannot defeat with your sword alone. 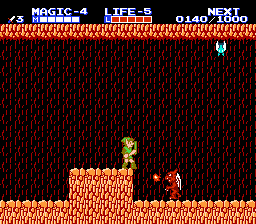 You will later get Fire Magic which will let you shoot fireballs from your sword. These fireballs can damage enemies that are otherwise indestructible. "Only the Hammer can destroy a roadblock." Roadblock being the literal roadblock next to town. The Hammer can destroy any boulder as well as any forest tile. "Get the Candle in Parapa Palace. Go west." This is a little confusing, but I think it would make more sense if it was "[then] go west." Parapa Palace is to the east, but you do go west after retrieving the Candle. "Find the heart in Southern Parapa." As I mentioned before, Parapa is the desert on the other side of the cave you're about to enter. Seems like there's a hidden Heart Container there! "Each town has a wise man. Learn from him." Each town does have a wise man in it who will teach you a new spell. These spells are critical and necessary to get through the game. Two towns also have a sword master in them who will teach you new techniques, but we'll get to those later. Near the exit of Rauru is a long white house. A woman will exit it when you approach it and she'll tell you to talk to her uncle before you leave town. Head inside the house and walk through it until you find a wise old man in the second room. He will give you Shield Magic. This magic will make Link more resilient to damage. To use magic, press the start button and then move the cursor to the magic you want to use. Exit the menu by pressing start again, then press select to use the magic. If you don't have enough magic in your meter, you won't be able to use the spell. Exit the house and then exit the town. 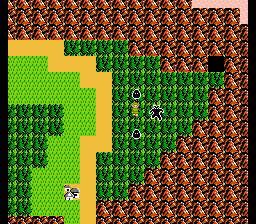 Back on the overworld, head north a bit along the road and then cut east through the forest and into the cave. It's dark inside, but there's only a single Lowder crawling along the floor. Do like you did before in the other cave and watch the floor to find his location, then strike him down. Proceed left through the cave and you'll end up in Parapa Desert. The first order of business here is to follow the mountains east and then take the path south when you reach the shore. There will be a hidden battle scenario on the path which is a bit dangerous, but it's worth venturing through. You'll find stone columns rising up from the water that you must jump across, but watch out for the bubbles which are rising from below. If one of them touches you, there's a very high probability of it knocking you into the water and you losing a precious life. Take your time crossing, jumping across the gaps and avoiding the bubbles until you're out of this scene. Continue heading south and you'll come to a plains tile surrounded by forest tiles. Step onto the plains tile and you'll find another hidden area. This time you'll have to battle a Goriya in a mini Stonehenge-like area, but the battle is for your first Heart Container. Be sure to kill the Goriya before grabbing the heart, because he'll keep throwing boomerangs into you and you won't be able to move since you're holding up your new treasure. 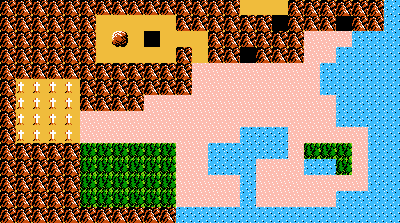 After getting your prize, head out of here and back to the overworld, then follow the path back the way you came and then follow the shore north all the way to Parapa Palace. This is the first real challenge you'll have to face. It's not exceptionally difficult, but there are a few annoying things you'll have to contend with here. Enter the palace and proceed right through the pillared entrance and take the elevator down. To operate the elevator, simply stand in it and hold either up or down to move in that direction. On the next screen, head left. There are armored cat-like enemies that are here called Tinsuit. It goes without saying not to let the enemies hit you, but with these they'll not only drain your health, but your experience as well. Each hit from a Tinsuit will drain 10 experience from you, which is pretty much devastating at this point in the game. Once you've made it to the bottom of the elevator, continue left into the next area.. Watch out for the two Bots over your head on the ledge, as they have a tendency to jump down at you. Also be aware of the Stalfos which will come down from the ceiling towards you. It has a shield, so you'll have to duck and stab it underneath its shield to damage it. At the end of the corridor is a key. To pick up a key, strike it with your sword. Once you've collected the key, head back to the previous screen with the elevator, only this time go past it to the right. Now that you have the key, walk into the wall with the keyhole and it will disappear. Proceed through it and avoid the Tinsuits and the Bubble which is bouncing around one of the rooms. Now you'll be in a longer room with an elevator going down. Ignore this elevator for now and proceed past it, taking out the Stalfos which will appear and attack you. When you enter the next room, you'll see a blue Bot in the center of the room and a Bubble bouncing around. Kill the Bot, and then position yourself so you can repeatedly stab the Bubble. They appear to be invincible, but they're not and they hold an impressive 50 experience points when you kill one. As you strike it, Link will slowly edge backwards. You'll have to continually move yourself forward a bit so you remain within striking distance. After literally 100+ strikes, you will defeat it. It sounds like it takes longer to defeat than it really does, but the rewards are definitely worth the time. Forward a little bit is another Stalfos and another elevator. Take this elevator up into the next area. Follow the path and you'll come to a key sitting on the ground. Duck and stab it to collect it, then press on into the next screen. 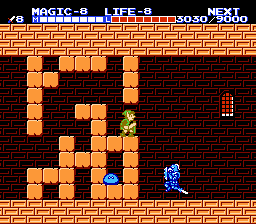 In this area you will come to a new enemy named Guma who throws maces at you in an arching pattern. Wait for the gap in his attacks, then step through them and cut him down. Directly behind him is another key. Collect it, then head back to the elevator and take it down to the previous floor. If you have taken significant damage by this point, there is a fairy floating in the air to the right of the elevator. If you're not at death's door, however, I would suggest saving it. Head left, killing the blue Bot and the Bubble again. In fact, head left into the next room, then immediately back and kill the Bubble again. A little more experience never hurts. Continue left and now go down the elevator I told you to ignore before. Go left at the bottom, but walk slowly so you can get the drop on the Bubbles which fill the hall. When they spawn, they will be stuck on the left side of the screen moving up and down. Keep them locked there by standing still until you've lined them up where you want them to go, then walk forward a bit and they'll come at you. By this point you should know what I'm going to say: Kill every Bubble in this room. There are several of them (including one which moves very fast), and while it will take you many strikes to kill them all, it's definitely worth it for the experience. 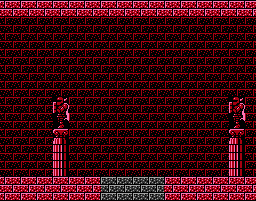 The next room has a disintegrating bridge over lava which will vanish as you walk across it. There is also a 50 point P-Bag on it if you're feeling brave. If you're not confident you can duck and strike it before the ground beneath you crumbles, then let it burn. After you make it across the bridge, go into the next room and take out the mace throwing Guma, then prepare yourself for the most powerful enemy you've faced yet. This orange knight is called Iron Knuckle, and it's serious business. Like the Stalfos, Iron Knuckle has a shield. However, while the Stalfos will let you crouch and stab it underneath its shield, the Iron Knuckle will not. It will take some fancy sword and shield work on your part to get through the Iron Knuckle's defenses, but it can be done. An easy way to get some hits in is to jump and then strike his face mid-air on the way down. It seems to confuse him a bit and he'll typically lower his shield so you can get through his defenses. After you defeat the Iron Knuckle, proceed past him and unlock the door. There you will find the Candle, which will allow you complete visibility in dark caverns. 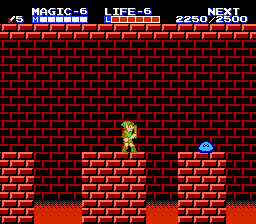 After acquiring your treasure, head back right across the disintegrating bridge and into the room with the Bubbles. Kill all the Bubbles again. Make your way to the elevator and take it up, then proceed right to the other elevator. Use the fairy here if you wish, as you might have taken some severe punishment from the Iron Knuckle. Once you have replenished your health, take the elevator down. You will almost immediately encounter another orange Iron Knuckle. He's in closer quarters this time, so you might have to use a more fancy strategy to defeat him. Continue past him and into the next room where a Guma and yet another Iron Knuckle await you. At this point, pay attention to your experience meter. When you defeat Horsehead, you will be given 50 experience points. Not much for a boss, but still. If you're relatively close to gaining a level but won't gain one solely from the experience you get from defeating the boss, go back and fight a few Bubbles until you do. I highly suggest this as you'll gain another level for free when you place the gem in the stone totem at the palace exit. If you're ready to fight the boss, head into the next room. Otherwise, go back and gain that level. When you enter Horsehead's chamber, you'll see him standing on the far side of the room beside a pillar. This is the first boss in the game, and he might be a little imposing, but he's really not that bad. The best tactic to fight this foe is to jump and crouch, then stab him in his exposed horse head. Doing so will put Link's sword directly where it needs to be to register a hit. Be wary of his spiked mace, though. If he hits you with it he can inflict big damage on you and send you spiraling back across the room. I suggest using your Shield Magic before you begin the battle to maximize your chances of survival. He's really not a difficult boss to take down if you stay on him and watch his attacks closely. After enough hits, Horsehead will explode into a brilliant display and a key will drop from the ceiling. This will happen after each boss is defeated. Try to stab it in mid-air to collect it for bonus cool points for anyone watching you play, then proceed right and stand underneath the stone totem. The game will automatically put one of the gems from your inventory in place, your magic and health bars will refill, and your experience will start quickly counting up to the next level. At this point in my game, my stats were Attack 3, Magic 4, and Life 5. Know that once you step foot outside of the palace, it will turn to stone. There is no revisiting a palace once you place the gem. Head southwest towards the cave on the opposite side of Parapa Desert and enter it. It is now completely illuminated thanks to the Candle! Head through the short cave and when you exit, go west towards the road. Before we head to the next town, we have to make a slight detour. As you're heading west, you'll see a desert to the north. Head to the northern most point of it and you'll find a small mountain with a cave inside it. Enter this cave and carefully make your way through it, making sure to notice the Ache bat hanging from the ceiling and the Octoroks stationed on a platform flanked by lava. At the back of this cave is a lone Goriya and a sacred trophy that he has apparently stolen. Defeat the Goriya by watching his arm movements. You'll know whether or not he's going to throw his boomerang high or low based off of his motions, and that way you'll be better prepared to block or dodge his attack. After you slay the thief, lay claim to the trophy, then head back out of this cave. You'll need this item in the next town. Also, I should note that the Ache you defeated before has respawned, so watch you don't get knocked back into the lava. Go southwest to the road and then continue on west until you see a town in the middle of a vast open area. This is Ruto, and it is home to a very important and valuable spell! "Hammer... Spectacle Rock... Death Mountain." Indeed, the Hammer is in Spectacle Rock in Death Mountain. We'll be going there very shortly. "I am Error." This guy. He actually says something different later on, but for now, that's all you'll get out of him. "Find magic in a cave south of the castle." We've already done this. It was actually the first thing we did! "Use keys in palaces they are found in." Pretty good advice, but I don't know that it's all that relevant. "Do not go south without a Candle." This warning is pretty safe to follow. Going south without a Candle is not impossible, but it's very difficult since you can't see all the peril in the cave you must travel through to get south. Good thing we have the Candle already, though! On the second screen you'll encounter a woman in red exiting her home as you approach. Talk to her and she will thank you for recovering the trophy and urge you to speak to her uncle inside. Like the last town, this uncle is actually a wise man and will grant you a new magic. This time it is the infinitely useful Jump Magic. Head inside and talk to him to add a new spell to your lineup. You will use this spell quite often. After getting your magic, there's nothing left to do in this town. Head out and then make your way south through the narrow valley and into the cave. Upon entering the cave you'll have to defeat a handful of Octoroks, which isn't a problem whatsoever. However, immediately past them is a Goriya. Use the same techniques you used when recovering the trophy to defeat him. The second screen of the cave has a few Lowders and yet another Goriya. This cave really doesn't have any surprises, at least until the next screen! Notice the Aches at the top of the screen. One of them is red. The red Aches are called Acheman, and when they land on the ground they'll turn into a red fireball spitting demon! The fireballs these foes shoot at you cannot be blocked with your shield, so you'll have to jump over them. Approach the Acheman until it swoops down, then when it changes its appearance lay into it with your sword. In a few strikes it will be defeated. Just past this encounter is a wall which you'll have to use your newly acquired Jump Magic to pass. Hit the start button and select Jump, then exit the menu and press select to use it. Scale the wall and head out of this cave. When you exit, there is a small forest tile to the right. There is a hidden fairy grotto here so you can replenish your health. I recommend stopping by here. Leave the grotto and then head due south through the swamp. 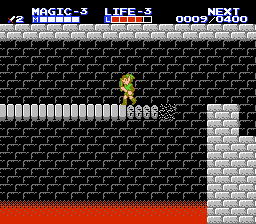 Link's movements will slow down to a crawl, so it's extremely likely that you'll end up getting attacked as you walk through it. Make a mental note of the cave here with the boulder in front of it, as we'll be returning here later for an item inside. 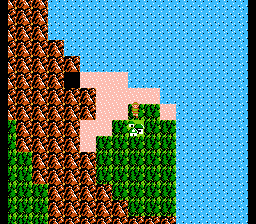 There is also a 1-Up Doll one tile left and one tile down from the boulder, but do not pick it up! 1-Ups do not respawn in this game once you collect them. In other words, you have one time in your entire playthrough to reap their benefits before they're gone forever. There will be a time when we'll collect them, but for now, ignore this one or any of the others you happen to find. After getting through the swamp, walk east to the road. Position yourself where the image to the right shows and you'll find a hidden house with a man inside named Bagu. Bagu is friends with the guards in the next town, and he'll give you a note which will tell them to let you pass. There are other hidden battle scenarios in these woods which you'll likely stumble upon, but there aren't any serious threats in them. They're more an annoyance than anything. Take a short walk back to the road and then cross the bridge south leading across the river. You'll have to do a quick battle scenario when crossing the bridge, and be warned, it is dangerous! As you're crossing, skeleton fish named Bago-Bago will leap from the water and spit rocks at you. Like the Tinsuits in the first palace, Bago-Bago will drain 10 experience from you every time you come in contact with one, so do your very best to not get struck by these things. Once you're on the other side, go east for a few tiles to the lone forest in the plains to find a 100 point P-Bag. Defeat any enemies in here and then head back west to the water town named Saria. "Eyes of Ganon are everywhere. Be careful." This of course meaning that be careful of who you speak to, as not everyone is trustworthy. "In Midoro Swamp, find a Handy Glove." This woman is talking about the item you'll find in the second palace. "Zzz..." "Let me be! Master is in woods north of river." This is a purple Bot sleeping on a bench in a house. If you keep talking to him, eventually he'll wake up and say the second line and reveal that this is Bagu's home and that he's in the woods north of the river. We've already talked to him, though. Walk through town, then right before you exit the first screen, a woman will exit her home and tell you she has lost her mirror. Walk left into the next screen and enter the first empty house. Position Link in front of the table at the back of the room and press the B button. Link will say, "I found a mirror under the table." That's right, Link just spoke. After finding this item, leave the house and then go back to the girl who had lost her mirror and speak to her again. She will be elated that you found it and invite you inside to speak to, I presume, her uncle. This wise man will give you easily the most useful magic in the entire game. The magic which will save your skin more times than you will even realize. I am, of course, referring to Life Magic. On the final screen of town you'll come to an impassible body of water. Enter the guard house and speak to the man inside. Since you have already met Bagu in the woods and have a note proving you know him, the guard will let you pass. Exit the house and a bridge will form, allowing you passage across. 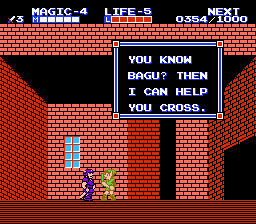 Later on and in the second quest you can use Fairy Magic if you want to avoid meeting Bagu for whatever reason. Make sure your health and magic are full and then exit town. 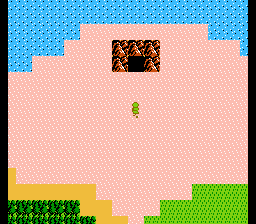 Enter the cave south of town and you'll find yourself at Death Mountain. I know what you're thinking: "Death Mountain?! We haven't even gone to the second palace yet! Isn't this part of the game supposed to be super hard and confusing?" Well, yes. We haven't gone to the second palace yet, and no, it's not super hard or confusing. Let's do this! Upon entering Death Mountain, enter the cave to the right. You'll know you're going the right way if you see two Bots on a ledge. There's nothing too scary here, so you'll get through this cave easily. On the other side, enter the only cave option available to you. Here you'll have some standard fare Octoroks and a Goriya to deal with. Again, nothing too out of the ordinary here. On the other side, enter the only cave option available to you. See? This isn't too confusing. In this cave we'll finally have a new challenging enemy. Battle your way through the Aches and you'll soon see an elevator leading up. Ignore it and walk past it. Here you'll meet an orange alligator enemy named Daira. It has an ax that cannot be blocked with your shield, and you have a very small window to actually strike this foe. He can shave off about an entire block of health with one successful strike, so be careful. When he raises his arm back to swing his ax, that's the time to strike. It's a personal preference of mine to crouch and stab him when he raises his ax, as it locks Link into place for the strike. You can also do a crouching jump and strike, then strike once more on your way back down. It should take about five hits to defeat him at this point if you're leveled around the same as I am at this point. Once you defeat him, continue on right and out of the cave. 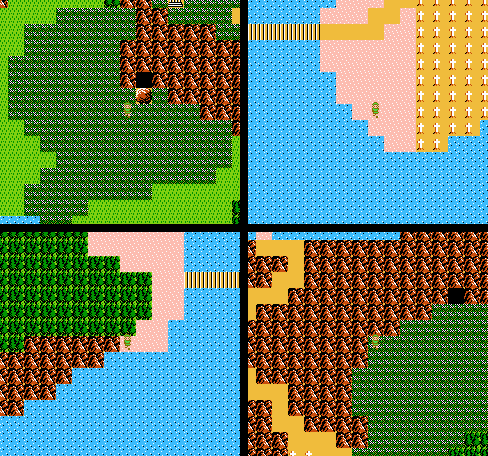 Back on the overworld, you'll have another choice on which cave to enter. As you did before, enter the cave on the right. You'll know you're going the right way if you see a bridge over lava. A bridge which will soon have Bago-Bagos flying up onto it from below. Like I said before, avoid contact with this enemy because it will drain 10 experience from you every time it hits. Here's a way to think about it. That Daira you just killed, the one that you might have struggled with that probably took some of your health away? He gave you 70 experience points. You get hit by seven Bago-Bagos and it just negated all that work. Not nice. Make your way across the bridge, killing every Bago-Bago you come to and exit the cave to the right. On the other side of the cave, enter the only option available to you. This cave is bad news. A Bot will drop down from the top ledges at you, and it'll totally be in your way. Coming at you from the right is a red Daira, which is significantly more vicious than the orange one. Red Dairas will actually throw their axes at you, and like the orange ones, these axes cannot be blocked with your shield. You have to jump over these axes and get in close enough to attack. You can use the platforms at the top of the screen to bypass this devastating enemy, or you can take it on and defeat it. 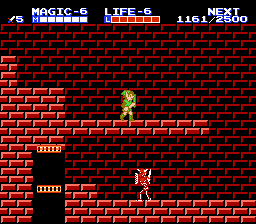 Of course to bypass it you'll have to use Jump Magic to reach the platforms, but there is a red magic decanter up there which will replenish all your magic. My strategy to defeat it is to lure it towards you and wait for it to throw an ax. Once it does, jump the ax and try to get close enough so you can strike on your way down from your jump with a ducking thrust. Only attack him this way after he has thrown an ax, or you could easily get overwhelmed by him. Like the orange ones, five hits at this point is about all it will take to defeat it. After you have either killed the Daira or avoided it entirely, exit the cave. On the other side, enter the only option available to you. Here you'll face a Goriya, which at this point has probably become a "who cares?" enemy after fighting Daira. Which, speaking of that, just past the Goriya is an orange Daira. Don't forget that you have Life Magic and can replenish most of your life should the situation arise. Don't be afraid to use magic, especially when it comes to survival. From this point on, every time you exit a cave you'll only have one direction to go, so I won't mention that again. In the next cave you'll see the floor is gradually descending. What this means is that you're coming down off of Death Mountain! You've almost made it. Of course, there's an ill-positioned Daira on the way down here, but you can defeat him the same as before by approaching him when his ax is up and striking him while ducking. Once you get past him, there's another one just a few steps away. The next cave is the same thing, only you walk it from right to left. There are more Daira enemies here, but at the end is a red magic decanter which will refill all of your magic. 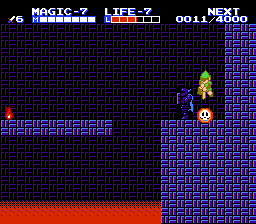 Use your Life Magic if you're getting low or even Shield Magic if it will help you get through this part, because this is the last part of Death Mountain and it would be awful if you died right here. It's got Spectacle Rock at the top. The cemetery where the Magic Sword was. The Lost Woods near it. It even has Lake Hylia in the same shape in the center! Pretty cool stuff. We're going to head to where that black tile is at Spectacle Rock. Walk onto the tile to enter another cave. Right off the jump you're going to have a red Daira coming at you followed by two Lowders and two Achemans. Clearly there is something valuable inside this cave. On the following screen are some annoying Megmats and an orange Daira right before an elevator leading down. Take the elevator down and then head right, and of course there's a red Daira blocking your path. On the next screen are a series of dangerous jumps over lava pits. You'll encounter a new enemy here named Myu, a creature which cannot be defeated until you have a new sword technique. When you come to it, let ii hop off of the ledge by itself. There's no use risking it knocking you to your doom. Get your Life Magic ready, because you're probably going to need it. In this narrow corridor you'll be rushed by an orange Daira, and then when the room opens up, a red Daira will come at you as well. Directly on the other side of this assault is the Hammer, which is the entire reason we came here. Claim your prize and then head back left to the elevator. If you're feeling brave, continue left past it. You'll encounter another red Daira which is good for some more experience. After you're done here, head up the elevator then go left all the way out of the cave. Congratulations! You've just survived Death Mountain! With the Hammer, you'll never have to go through it or the cave north of Moruge Swamp ever again. Once you're out, use the Hammer on the boulder directly left of the cave (the left rock of Spectacle Rock) and then step onto the tile where it once was. 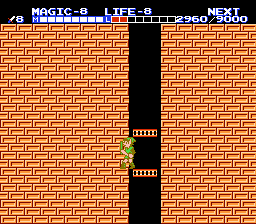 Link will fall through the ground and into a secret room containing a Magic Container. Collect your container and then hop out of here back to the overworld. Enter the cave on the far right side by the shore to begin making your way out of here. This cave is full of dangerously placed Octoroks, but if you're careful you shouldn't have anything to worry about. Once you're through, just walk north along the shore to another cave, only this one will just dump you out on the other side. That's nice of the game to do that. After you appear on the other side, you'll have a two screen bridge to deal with. The first screen has some sad little Moblins and a Lowder on it, but the second one has a red Daira, which is exactly what you were wanting to face again. There are also bubbles rising from the water below, so you have those to watch out for as well. On the other side of the bridge is an enormous cemetery. We're not going to do anything with it for now (in fact, stay out of it completely) so head north to the road and then use your Hammer on the boulder blocking the path. Follow the road back to the swamp you crossed when you came out on the other side earlier after using your Jump Magic. If you'll recall, there's a boulder I told you to remember. Approach that boulder and smash it with your Hammer, then enter the cave behind it. It's a short cave, but you'll have a bit of peril inside of it. 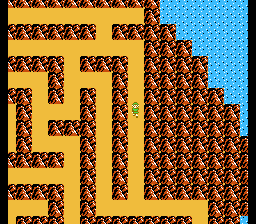 You did just cross Death Mountain, though, so this shouldn't be too difficult. First up you've got a bridge with Lowders on it and the always annoying Bago-Bago. Past that in the next screen is an orange Daira followed very closely by two red Dairas. Once all your foes are dispatched, hop the lava pit and retrieve the life saving medicine which is sitting on the ledge. Make your way back out of this cave, through the swamp, then back to the road. After you reach the road, go east and then follow the road all the way to the harbor town on the shore. "Ask Error of Ruto about the palace." Revisiting Error at this point will yield the important info, "South of King's Tomb in Mido is a tunnel." This is how you find the third palace. "The island palace in the south has a Raft." It sure does! But we're not going there for a while yet. We did kind of break the order of operations by coming here before the second palace. "Find magic in a cave in Moruge Swamp." This is telling you where to find the Water of Life you needed for the sick child. Good thing you already have it. 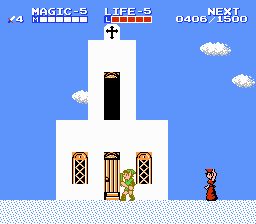 You will encounter a building which looks like a church and has a door up high on it. Use the ever useful Jump Magic and take a running leap to get up to the door. Enter it and make your way through the church until you find a knight in the back. This is a sword master and he will teach you a new technique which will make the game a whole lot easier. After speaking with him, you now know the down thrust technique which is accomplished by holding down while you're in mid-air. Link will stab down and land on his enemies and in many cases inflict damage to them. It's very useful and makes the game a lot easier. On the screen following the church, an elderly Hylian will exit the first white house. Talk to her and she'll see you have the Water of Life and let you inside the house. Inside, speak to the wise man to learn the Fairy Magic which will literally turn Link into a flying fairy. As a fairy, Link can fly all over and even pass through keyholes in palaces. Once you have the Fairy Magic and the oh so important down thrust technique, we're done with this town. Exit and get back on the road. Head west and destroy the boulder on the road, then walk north a bit until you see another boulder blocking a cave on the right. Destroy the boulder and then venture inside cave. In the back of this cave is your second Heart Container! Once you've nabbed it, you're done with this cave, so go ahead and leave. Once you're back on the overworld, journey a bit west and enter the cave, then head to the back of the cave for a nice 200 point P-Bag. Now... we can finally enter the second palace. Trudge through the swamp and continue pressing west until you come to Midoro Palace. Upon entering the second palace, my stats were Attack 4, Magic 5, and Life 5. Strike the Iron Knuckle statue at the palace entrance for a red magic decanter and then ride the elevator all the way down to the bottom floor. Proceed right, taking out the Bots and avoiding the projectiles coming at you from the Ra statue on the wall. In the next screen you'll have to take on two Gumas. Dodge your way through their mace onslaught and cut them down, then grab the key at the far end of the room. Once you have it, return back to the elevator and take it up one floor. Head left off of the elevator and kill the Aneru snakes, then be sure to kill the Bubble. I'm sure you remember these guys from the first palace. This time your levels are higher and you have the down thrust technique, so they'll go down much quicker and easier than before. If you're relatively close to gaining a level, go ahead and grind a bit here until you do by killing the Bubble then leaving and returning to the screen. It shouldn't take much time to rack up enough experience here to gain a level. After gaining a level (if you're close enough or chose to) enter the next screen to the left. In the middle of the screen a blue Stalfos will drop down at you. 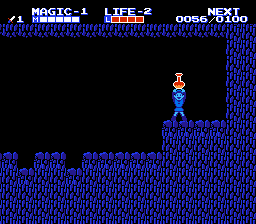 The blue Stalfos is a bit tricky, as it will leap over you and keep you from successfully landing a blow against it. Once you've defeated them, continue left and grab the key at the end of the narrow corridor. Now that you have laid claim to both keys, head back to the elevator and take it up one floor. Make your way left, avoiding the dripping Bot pillar and go to the next screen. Here you will encounter the annoying and dangerous Ra, a flying dragon head with a waving attack pattern and the ability to drain your experience if it hits you. Your down thrust will make short work of them, but be very mindful of their pattern when they're coming at you. Use one of your keys on the locked door and then enter the next screen. Danger awaits here. The erratic attack patterns of the Bot make this room extremely perilous as they can make short work of you by knocking you into the lava below. It's best to let them leap into the lava themselves if they're close enough to the edge so you don't have to worry about them. Carefully navigate yourself across the platforms, grabbing the key on your way. You'll soon come to a room with a high ceiling with two orange Iron Knuckles and a fast moving Bubble. All of these enemies can be easily dispatched at this point, so defeat them and then enter the next screen. Strike the Ra statue on the wall by the descending stairs to find a red magic decanter. If you need to, replenish your life and then collect the decanter. Take the elevator down one floor, then make a left. You'll have a stationary Aneru and a blue Stalfos to deal with, so take them out and then unlock the door to the left. On the next screen you'll see blocks falling from the ceiling. If you don't make it through fast enough, simply leave the screen and then return to clear it and try again. There is also a 50 point P-Bag here on the floor. If you're not able to get it, don't worry about it. You'll be able to shortly. In the next room you'll find your first red Iron Knuckle. It's just a slightly tougher version of the orange one, so you already know how to defeat it. Use your key on the door on the opposite side of the room and claim the Handy Glove. This item will let you smash certain blocks by striking them with your sword. After acquiring your item, go back to the elevator and take it down one floor. There are two orange Iron Knuckles here as well as the flying eye enemy Moa. Use the Jump Magic to get the height necessary to strike down the Moa, but be careful to not let it touch you as it too will drain your experience. The next room has some Bubbles and an elevator going down. For now, ignore this elevator and continue to the right, defeating the Bubbles that bounce down in your path. Walk down the narrow corridor killing the Tinsuits in your path and you'll eventually come face to face with another Guma and a key. Kill the Guma, grab the key, then head back to the room with the elevator. The boss of this level will give you 200 experience points, so if that doesn't put you over the edge then stay here and kill Bubbles until you're within range. You won't have many options from this point to get experience other than a few stray Iron Knuckles and a P-Bag. In a screen or two, you'll encounter the next fearsome palace boss. As his name suggests, this boss has a helmet head. In fact, you have to knock his helmet off two times in order to reveal his actual head. His helmets, as well as his actual head, are his weak points. When you deal damage to one of the helmets, you'll knock it off and it will begin flying around the top of the room shooting energy projectiles at you. Not only that, but Helmethead can shoot fireballs at you himself before you even knock off one of the helmets. To defeat this foe, do a jumping crouch stab right in the face. With your stats being as high as they are, you really shouldn't have to strike him more than six times or so. You can also get on top of him and down thrust him to death, but it's a bit more risky and you'll probably take damage when his helmets start flying off. With enough damage, Helmethead will go down and a key will drop from the ceiling the same as it did before in the first palace. Collect it and head right, unlocking the door and placing the second gem in the stone totem. Without missing a beat, we're going to go ahead and take on the third palace because there is literally nothing else we can do at this point other than that. After exiting the palace, go east back through the swamp to the road. Follow it south to where the boulder blocks your path and destroy it. Walk into the huge cemetery you avoided before and step onto the cross tile which is in the middle. I should note, while in the cemetery, random battles are extremely hazardous. You will fight floating eye enemies named Moa which will drain an incredible 20 experience from you should they hit you. Avoid them at all costs. This central location is called King's Tomb, as the elderly Hylian there will tell you. We're only using King's Tomb as a marker to find the third palace. Error told us that south of King's Tomb is a tunnel, and since we don't see an actual cave here, there's gotta be a secret. Leave the tomb and walk due south until Link falls through an invisible hole in the ground. Looks like our friend Error was right after all. You'll end up in a cave with several Lowders. As you're falling, hold down to down thrust the one which will be directly underneath you. Once all the nasty beetles have been defeated, use some of your Fairy Magic to turn yourself into a fairy and fly over the tall wall to the right. Follow the path out of this cave. Upon entering the third palace, my stats were Attack 5, Magic 6, and Life 6. When you enter this palace, the Iron Knuckle statue will either drop a red magic decanter or spawn a red Iron Knuckle. If you're low on magic, go for the red decanter by leaving the palace and re-entering until it spawns. Otherwise the red Iron Knuckle is a nice 100 experience foe to defeat. Ride the elevator down and enter the palace. Once inside, you'll soon encounter a new enemy named Doomknocker. Doomknocker is a hammer throwing knight which is sometimes placed in terrible locations throughout a palace. His hammers return to him like a boomerang when thrown, and he even jumps. His hammer tossing is also something which you cannot defend with your shield, so you'll have to jump them should one come your way. Something to be aware of about his hammers is that they'll return to him even if they've already returned to him before. What I mean by that is say he throws a hammer and you jump it. It will come right back to him and go past him, but if you follow it, it will change direction again and head back to him. In other words, if you follow a thrown hammer, it will just fly back and forth across the screen forever. This guy is really nothing to worry about with the down thrust technique, though. Just past him is a second new foe, Parutamu, an armored skeleton. This enemy is basically just a Stalfos with armor. Use the same tactics you use to defeat a regular Stalfos to defeat Parutamu. Continue on through the palace through a few screens until you come to a room with a key in the floor. Now that you have the Handy Glove, you can use the down thrust technique to break the blocks and claim the key. There's also a 100 point P-Bag a little past it in the floor, too. Be sure to claim that goody as well. In the next room, be sure to defeat the two red Iron Knuckles. They're positioned so you can avoid them, but getting their experience is worth the few seconds it would take to defeat them. Jump up and to the right until a red Parutamu drops down in an area beneath you. You can make the jump across the gap without using Jump Magic, but you have to be pixel perfect with it. There's nothing wrong with using Jump Magic to clear the gap, though, so use it, jump the gap, then continue right. You'll be in an outside area with a Moa and a red Iron Knuckle. Take on your enemies and take the key sitting on a block on the far side of the room. Head back inside and drop down into the lower area with the red Parutamu and take the elevator down. To your right is a locked door. Use your key on the door and continue on right. You'll then be attacked by Mau, a beast head which moves in a very... we'll say Etch A Sketch-like pattern and shoots projectiles at you. Like Ra, the dragon head with similar attacks, it will drain your experience if it hits you. Be very careful of the Bot on the following screen. It can suddenly change direction and knock you into the lava. Grab the key on your way through and kill the red Iron Knuckle. Try to not let him fall into the lava as you'll just make things difficult for yourself on the way back through. Also, you know by now I'm just going to tell you to kill everything, so you might as well. You'll be attacked by a red Iron Knuckle when you enter the next screen. Do a controlled attack and keep him at the front of the screen. Don't rush him and push him back, because if you do then you'll not only have to contend with him, but a new blue Iron Knuckle as well. Blue Iron Knuckles are tough palace foes which are extremely aggressive and have the ability to shoot projectiles from their swords just like Link. Fortunately they are defeated the same way as every other Iron Knuckle. 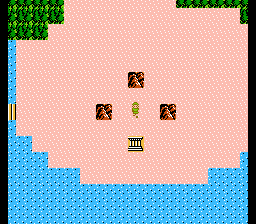 Just past this enemy is the Raft, which is an item we need to make it to the second part of the game. After grabbing the raft, head left and make your way all the way back to the elevator, only this time continue left past it. You'll come to a red Iron Knuckle and an elevator. Keep going left past the elevator and into the next room. Scale the breakable blocks and continue until you see a key at the bottom of the screen. Make yourself a block staircase leading down, nab the key, then climb back out and go back right to the elevator. Take it down into the next room. Keep an eye out for the 100 point P-Bag at the top of the screen. You'll need to use your Jump Magic to get to it. There is also a red Parutamu and a Doomknocker to deal with, but you shouldn't have any problem with them at this point. The next room is home to several Iron Knuckles and a P-Bag. At this point, if you are close to a level gain but won't gain one from the 300 experience you get from defeating the boss, backtrack and leave the palace. It sounds crazy, but it will benefit you in the long run. The good thing about it is that you don't have to worry about keys or collecting the raft again. It doesn't take long at all to get out and get back to this point if you don't have to worry about that. If 300 experience will put you at a level gain, then proceed into the next room. Do you like the blue Iron Knuckle? Because here's one on a horse. When entering the boss chamber, you will see nothing but hear the boss music playing. Rebonack will rush at you from the right side of the screen and try to get you with his lance. He'll make several passes back and forth across the room, and as he does, you'll have to do some well-timed down thrusts to damage him. You have to leap over the horse and come in contact with Rebonack himself in order to successfully score a hit. After enough damage has been dealt, Rebonack will abandon his horse and come at you on foot. In this form, he's basically just a blue Iron Knuckle like the one you took on before. Rush him and keep trying to get through his shield like normal. You'll eventually push him off the screen, and when you do, turn and run all the way back to the other side and let him come back at you. He'll be shooting at you from his sword the whole time, so you'll have to turn around and block his attacks as you flee. Once you're on the other side and Rebonack has stopped his pursuit, rush him again and keep trying to get hits in. Repeat the process until he is defeated. Collect the key and place the gem, then leave this palace once and for all. Once you're out of the palace, make the short journey back into the cave. After a very short spelunking adventure in the cave, you'll be back in the cemetery by King's Tomb. Continue north to the road and then travel east to the dock next to Mido. When you step onto the dock, Link will automatically disembark and head to the other side. Enemies here in the plains are tough and can typically only be damaged by using Fire Magic, a magic which you will acquire in the next town. You'll find Tektites jumping all over and Zoras which have made the journey from the water to land and are now found in some caves. There is a suspicious forest tile a bit south in the plains. Walk down to it to find a secret grotto with a P-Bag in it. After collecting it, venture to the east and in no time at all you'll see the town of Nabooru. "With Boots, I could walk on the water." This villager is telling you about the abilities of the Winged Boots found in the Maze Island Palace. You can walk across certain bodies of water while wearing them. "Jump in a hole in the palace if you go." This is a basic mechanic you'll begin to encounter in a few upcoming palaces. Which hole? Which palace? Probably the Maze Island Palace. "See a man in Darunia before the islands." This could be a reference to either the Reflect Magic or the up thrust technique, both of which are found in Darunia. It's more than likely talking about Reflect Magic since you need it to defeat the boss. "The River Devil eats those who are weak" The River Devil does no such thing. It's just an impassible barrier until you get an item from an upcoming palace. "....." "You are persistent. Find Heart over ocean." There is a red Ache at the top of the screen in one of the houses. Use the same process you used on Bagu's purple Bot to get it to talk. Once you get the Winged Boots, you can find a Heart Container on your way to the Palace on the Sea. On the second screen you'll find a woman who says she is thirsty. Walk just a bit to the left towards the water fountain and press B. 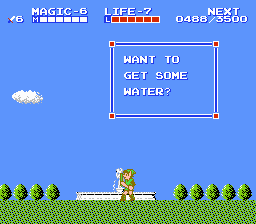 Link will collect some water for her, so take it back to her and she'll invite you inside her house. There is a wise man inside who will teach you Fire Magic. Fire Magic is a powerful spell which will make your sword shoot fireballs instead of the regular projectile blasts. It can pierce the impenetrable hide of several enemies you'll encounter around this point in the game like the aforementioned Zoras and Tektites. Exit the town and follow the road north to a cave. This is a good place to use your new Fire Magic. At the beginning of the cave you'll have to take on a trio of Achemans, but just past them is a Zora. Your sword cannot inflict damage on them normally, so try out your new spell on them. Once you're through the cave, head east through the woods and eventually you'll come to a long bridge. This bridge takes you to Maze Island where the next palace is. Before we visit it, though, we're going to do a few things. When you come out on the other side of the bridge, walk down and then stay on the path heading east until you reach the wall. Follow it all the way to the end and Link will fall into an invisible hole which will take him to a cave with a Geru in it. Geru is a fierce opponent that can block your attacks with a shield. Think of it as an Iron Knuckle of the overworld. This Geru has apparently kidnapped a child and is holding him at the back of the cave. Destroy the Geru and then save the child. After that, you're done here, so leave the cave and exit back onto the overworld. Follow the same path you took to get to the cave back to the bridge, then cross it and go west across a lot of forest and plains. You'll eventually come to a desert section of the map surrounded by mountains. Follow the path through the valley and you'll enter a mandatory battle scene with Octoroks. It's easy enough to get through it, just watch out for the Octoroks you encounter. When you finish it and are put back onto the overworld, a few steps more will take you to an identical battle scene, only this time there are bubbles rising from the bottom of the screen at you. This makes it quite a bit more perilous, but it shouldn't be anything you can't handle. Once you've made it past the danger, the mountain town of Darunia awaits. "It is said the east of Nabooru has..." ...a road leading directly into the sea. That's suspicious. "The Devil does not like noise." The River Devil can only be defeated with an item which makes noise. News of the River Devil has traveled far, it would seem. "The palace has a false wall." It sure does! Which wall? We'll get to that later. "A powerful knight lives in this town." This is referring to the sword master in the town who will teach you the up thrust technique. Nothing too noteworthy. However, there is something extremely noteworthy in this town, and that's the up thrust technique! On the second screen of town, continue walking left and pay attention to the houses as you go. They appear to get shorter as you go. When you reach the final house, use the Jump Magic and jump onto the last house. Hop right across the roofs until you get to the final house. 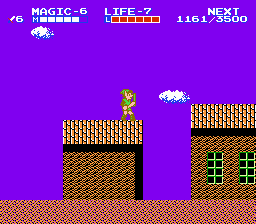 Jump on top of the chimney and press down, then Link will shimmy down it and gain access to the house. In the back you'll find a new sword master who will teach you the up thrust technique, which while a good move, isn't as devastating and game breaking as the down thrust. Still, it is a helpful move to have. Upon entering the third screen of Darunia, an elderly Hylian will exit her home. Speak to her and she'll thank you for rescuing her child and invite you inside. Inside the home is a wise man who will teach you Reflect Magic which is necessary to defeat the boss of the next palace. Once you have the up thrust and the Reflect Magic, leave town and head all the way back east to the Maze Island. Maze Island thankfully isn't confusing to navigate, but you will have some battle scenes you'll have to get through in order to make it to the palace. To begin, walk south and then east until the path will let you go north. Go east and you'll immediately have to take part in a battle. 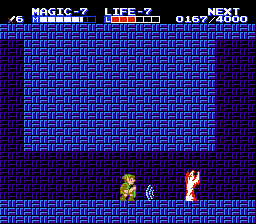 You'll encounter Tektites and a Zora here, so you'll have to use Fire Magic to defeat them. Continue north, ignoring the first bridge you see. Cross the bridge then go west two spaces, then follow the southern path around the L shaped mountains. On the far left side you'll fall into a hidden grotto and find another Magic Container. Continue following the path around and then walk north through the opening. You'll very soon enter another battle scene with a Bot, two Zoras, and a Tektite. Again, use your Fire Magic to make short work of these foes. After the scene, continue east two spaces and then north, making a right the first chance you get. As you would expect, you'll have a battle scene with two Octoroks and two Tektites. You'll also find a red magic decanter here to replenish all that magic you've used from casting Fire and Life Magic. Once you finish the scene, take either the first right or the second right. Either one is fine as they both end up in the same place. The second right might be a bit easier, though. Once you're through these scenes, follow the path to the palace. Upon entering the fourth palace, my stats were Attack 6, Magic 6, and Life 7. Take the elevator down and go right at the bottom. Defeat the duo of Parutamus and take the elevator down again. Walk right through the opening and you'll encounter a third Parutamu. There are different enemies in this palace, trust me. In the next screen, use Jump Magic and leap from the disintegrating bridge to the other side. You can make the jump without using the magic, but it's just easier this way. Continue right and you'll be in a room with a narrow platform and lava beneath it. About halfway through is a Doomknocker. He might jump to his doom when you approach, and if he does, be very cautious on your return trip through the room because he will respawn. At the end is a key and a statue which will either hold a red magic decanter or a red Iron Knuckle when struck. Once you have the key, go left back into the room with the disintegrating bridge. Fall into the big hole towards the right side. The screen will change and you can land on another disintegrating bridge if you didn't fall just right, but make sure you go right when you're here. On the following screen, two Parutamus will come at you, and then you'll have a battle with another blue Iron Knuckle. Use the same techniques you used on him before to defeat him. In the back of the room are the moderately useful Winged Boots. Take them and then walk back to the room with the dual disintegrating bridges. Again, fall into the hole and hold right. You'll land on the far side of a disintegrating bridge over lava. Exit the room to the right and you'll be in a room that is the same as the one you were in before, only there's a red Parutamu and a fast moving Bubble in it as well as the Doomknocker. Don't forget, if the Doomknocker leaps into the lava on his own he will respawn and potentially make your return journey through the room difficult. In the back of the room is another key. Grab it, then head back to the previous room. Here you will have a very dangerous situation with swooping Ra heads and the disintegrating bridge It is probably best to just avoid them because if you stop to down thrust one, there's a high chance that another Ra will come in and knock you into the lava. This can be a tough screen to get through, for sure. 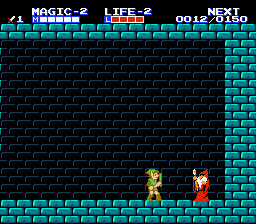 After crossing the bridge, enter the next screen and you'll encounter an enemy named Wizzar which is very similar to the Wizrobes in the first game. To defeat them you'll have to use Reflect Magic and bounce their magical attacks back at them. They give you 100 experience when destroyed, so they're definitely worth killing. Unlock the door and then continue left past the elevator to the next room. Here, scale the wall and continue left until you see a key on the floor. Make a staircase down to it and grab it, then go back to the elevator you passed and ride it all the way back up to the top. We're back near the palace entrance now. Head left back to where you first entered the palace, then continue on left past the elevator. There are more Wizzars here, so take them out with Reflect Magic. On the following screen you'll see a key in a small enclosed space with a fast moving Bubble. Walk left just a bit and take out the red Iron Knuckle, then use Jump Magic and destroy the ceiling, kill the Bubble, and grab the key. Unlock the nearby door, then ignore the elevator and continue going left. In this familiar room, you can find a 200 point P-Bag and a key on the ground level. Kill the Doomknocker up top, and be sure to get the one on the far left side of the room as well. They're worth a bit of experience, you know. When you've taken care of business, go right and take the elevator you passed earlier down to the next level. Head right when you reach the bottom. You'll come to a room which looks just like the one you were in earlier with the Doomknocker. This time, however, a double dose of Ra will swoop into the room and try to knock you into the lava. It's very easy to become victim to their attacks, so be careful. At the back of the room is a key and a statue which will drop a red decanter or a red Iron Knuckle depending on your luck. Proceed back across the room, but be aware, if you've killed the Ra on your first pass, they have respawned. Go left past the elevator and into the next room. There is a disintegrating bridge here with a Myu on it, so use your down thrust to defeat it. Continue on through the room and then take the elevator down. Use Jump Magic if you can spare it and grab the 100 point P-Bag at the top of the screen. Magic might be tight at this point, so be aware you're going to have to have enough magic left over to cast Reflect Magic soon. Following that are two red Iron Knuckles before the boss room. Defeating the boss will give you 300 experience points, too. Keep that in mind while you're trying to level up. Carock is a bad customer who can only be damaged by his own magical attacks. Exactly like the Wizzars you encountered before, Carock will try to shoot you with a low magical projectile that you must use Reflect Magic to bounce back at him. The easiest way to defeat him is to use your magic and then crouch down in the left corner. Carock will teleport randomly all around the room and there will be projectiles flying everywhere, but the chances are great that he'll teleport himself right into the path of one of the reflected blasts. There is also a high chance that Carock will teleport right on top of you, and if he does, he'll knock you out of your position and damage you. If this happens, watch your health and use Life Magic if it comes to it, but definitely be sure to re-position yourself in the corner facing out so you can continue bouncing his attacks at him. Upon leaving the palace, you can use your new Winged Boots immediately and bypass the entire maze by walking on the river leading out. Pretty handy. Once you cross the bridge, walk a few steps south to the water and you can walk across it as well. Earlier you might have noticed the road heading east out of Nabooru earlier went directly to the sea. Well, if you follow that road east over the sea it will lead you directly to the next palace! On the way there, though, you can find a hidden Heart Container. From the palace itself, head west back across the water and press up each step you take. You'll soon find a narrow passage where you can walk north. Follow it until it stops you, then head east. You'll find the secret area in no time. If you want to know exactly where the opening is, it's ten steps into the sea from the road bordering the palace. Once you've found the treasure, go back and enter the palace. This is easily my least favorite palace. It's confusing and has a lot of passages you can follow which are a waste of time. Additionally, it has one of the most obscure secrets in the entire game in it. It's one of those secrets where people would say, "How are you supposed to know that?!" Well, in this case a villager in Darunia tells you about it, but it's still a bit vague. Upon entering the palace, my stats were Attack 6, Magic 7, and Life 8. Head down the elevator into this awful place and then right at the bottom, the only direction you can go. Fight your way through the stationary Anerus and into the next screen. 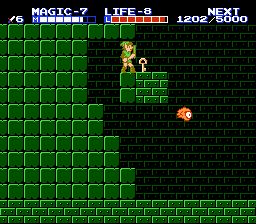 You'll have to use Fairy Magic to get over the wall here, but you'll also see a key which you cannot collect as a fairy. 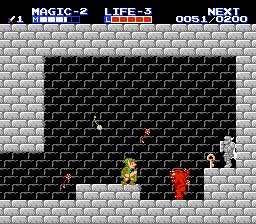 Continue past it and into the next screen, then head back into the room as Link and grab it. After getting the key, walk across the disintegrating bridge, being mindful of the Ra heads swooping at you from across the room. One hit from them and you'll more than likely be knocked into the lava below. If you just walk across the bridge they'll swoop safely underneath you. Be sure to grab the 200 point P-Bag on the bridge. Two red Iron Knuckles are waiting for you on the following screen, but by this point you shouldn't have any difficulty defeating them. Not only because you are familiar with their attack patterns, but your attack level is so high now it shouldn't take but two or three hits to defeat them. Take the elevator down and into the next room. Here you will find the teleporting enemy Mago. Your first instinct might be to pass them by or that it takes too much effort to kill one. Any time you encounter a Mago, make sure to kill it because you'll receive 200 experience for your efforts. Their high experience reward and how frequently they appear here make this palace a great place to gain levels. After you have killed the Magos in the room, head left. Going right leads to a dead end and isn't worth going down, even for the experience. Here you'll have a familiar room from the second palace. It's a good idea to let the blocks fall to completion before making your staircase up top to retrieve the key, but it's certainly not necessary. Be sure you do grab the key though before continuing on through the room. There is a Moa flying around on the left side of the room which you'll see once you start trying to get to the key. Remember, Moa drains your experience if it hits you, so be very careful. The once mighty orange Iron Knuckle will come at you when you enter the next screen. After defeating him, strike the Ra head statue on the wall to find a hidden red magic decanter. Check your life at this point to determine whether or not you need to use Life Magic before collecting it. Two more orange Iron Knuckles await after you collect it. Again, they're no match for you at this point. Take the elevator down and you'll be in a room with several Magos. Kill all of them, then make a decision. Right leads to a dead end, but there is a decent amount of experience down this path in the way of red and blue Iron Knuckles. However, the path is extremely dangerous and might cost you your life if you accidentally down thrust through the floor. There are also Bago-Bagos flying up from the lava below, which you'll recall drain your experience if they hit you. Weigh your options and your confidence level, then go either right for the experience or left to continue on through the palace. The Iron Knuckle statue at the end of the right path holds either a red magic decanter or a red Iron Knuckle, too. Use the ever useful Jump Magic to get on top of the area above the elevator and grab the 200 point P-Bag, then take the elevator down. On the next screen you're given some options on where to go. First, go left and get another 200 point P-Bag, then head right and use Jump Magic to kill the red Iron Knuckle and retrieve the key. Once you've got it, continue right into the next room. Make your way across the room with the Magos making sure to kill all of them. Here you'll have another lovely blue Iron Knuckle to defeat, and you'll come to what appears to be a dead end. However, this is actually the "false wall" that the villager in Darunia was talking about. Once the Iron Knuckle is defeated, jump through the wall and walk through it to the other side. If anything in this game could be considered "bad game design" or too vague, this would be it. Even though a villager tells you there's a false wall in the palace, they don't say which palace and they don't really elaborate on what false wall really means. In the next area, continue right past the elevator and follow the path up and around to a key. If you took the optional path earlier for experience you would have seen this key on the other side of the wall when you reached the dead end. Once you have the key, go back to the elevator you passed by earlier and take it down to the next floor. Danger awaits here, as you'll have an unending wave of Mau heads coming at you (which drain your experience) and three Magos, which I highly suggest defeating for their incredible 600 total experience. Chop out a section of the ceiling so you have room to move and stand your ground. Once you've taken care of the Magos, continue left to the next room. You'll have two Iron Knuckles to defeat here, one orange and the other blue, before you can unlock the door and claim the Flute. With the Flute, you can destroy the River Devil... and make something else happen later on. Once you've got the Flute, head right back to the elevator, then take it up and go left back through the false wall. Make your way back to the elevator and take it back up. If you go down the elevator it will lead to a dead end. There is a moderate amount of experience that way from two red Iron Knuckles, but it's not really worth the time unless you're somewhat close to a level gain. When you reach the upper floor, go left and unlock the door. With that, you've used up all your keys. 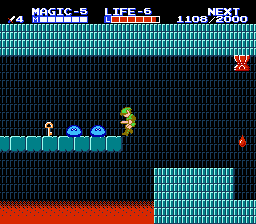 Continue through the door into the next room and use your Jump Magic to take out the Guma up top. There's a red magic decanter hidden in the Ra statue on the wall, so use some Life Magic if you're feeling low and then collect it. Continue past the elevator to the far left side of the room to find a Bubble, a red Iron Knuckle, and a 200 point P-Bag. Head back right and take the elevator down to the bottom floor. You'll find some Magos here along with an oddly underwhelming 50 point P-Bag. Once you've defeated these teleporting foes, leave left into the next room and take out the orange Iron Knuckle. There's a red Iron Knuckle up top but he won't bother you unless you provoke him. However, on the far left side of the room is a blue Iron Knuckle that you do have to defeat. Take him out and then grab the key, then head back to the elevator and ride it all the way up to the top. Quickly defeat the orange Iron Knuckle and unlock the door. Proceed through the room and defeat yet another blue Iron Knuckle, then climb the stairs and kill the red one which is waiting up top. The gang is all here, it would seem. You now have a decision to make. This palace has been harrowing, I'm sure. You have had to take on countless Iron Knuckles, outwitted many Magos, and navigated corridors which were more dead ends than anything. However, in doing so, you have netted an incredible amount of experience. At this point, you are at the end of the palace. You can step into the next room and take on the final boss if you wish, or you can leave the palace and re-enter it, defeating many of these foes again to gain another level. Keep in mind, this is not the final palace. You still have one more to go through, so you'd be completely fine not leaving and re-entering it. For myself, I was about 2000 experience points away from gaining a level right before the end. My stats before defeating the boss were Attack 7, Magic 7, and Life 8, meaning my stats would be completely maxed out if I gained a level and then finished the palace. I chose not to leave and to go ahead and finish it, but the choice is completely up to you. Gooma is a big, burly barbarian with a menacing ball and chain. Unlike most bosses in the game, Gooma's weak point is not his head, but rather his midsection. Striking him in the face will do no damage to him. The best way to take him on is to use your Shield Magic and your Jump Magic. Gooma will attack you by swinging a ball and chain at you, and he'll have a bit of a wind up before he sends it your way. The attack does not travel across the screen, but extends a bit from his body. If he hits you, he will do massive damage and send you flying back. Approach Gooma and do a quick crouch stab, then jump back away from him before he sends the ball and chain at you. His movements are very slow, but his attack can strike very quickly and send you into dangerous health levels. You really want to keep your distance from him. Shield Magic will keep you alive a bit longer, but you still definitely don't want to come in contact with him or his weapon. After defeating Gooma, place the gem in the totem and get the heck out of this place. Walk across the sea back to the main land and then head south. You'll see a cave along the wall and a boulder. Smash the boulder with your Hammer and walk along the shore to the east. Stay along the mountain range and when you approach the end of the wall you'll find a hidden area with a 500 point P-Bag in it. After claiming it, go back west to the cave and enter it. Inside the cave you'll encounter some Tektites. Use Fire Magic on them to make short work of them, then enter the next room to find the fire shooting scorpion Aruoda and another 500 point P-Bag. Leave the cave once you have taken the bag. 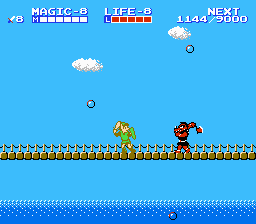 Stand in front of the River Devil and press the B button to play the Flute. Once the tune ends, the River Devil will flee and you can cross. In the valley that follows, you'll have to take on three separate battle scenes. In each one, stone throwing Gerus will be positioned along the top of the wall. They cannot be defeated, so you'll have to do some fancy footwork to dodge the stones they chuck down at you. Once you pass through all three of them, continue following the road to a bridge, but don't cross it. Head north through the forest and into the swamp. Enter the cave you see along the mountainside. Navigate your way through the small cave and you'll find a 500 point P-Bag in the back. Exit the cave after retrieving it and then walk a little to the east to another cave and enter it. The first room of the cave is full of Tektites, and you know the drill at this point. Use your Fire Magic to make short work of them, then proceed into the next room and you'll find two Gerus. Once you make it through the cave, you'll find yourself in a small enclosed area. Approach the forest and use your Hammer by pressing the A button on the area pictured to the left and you'll find a hidden town! This is probably the most vague thing in the game, as this mechanic hasn't been used anywhere else in the game. At no point have you had to use your Hammer to destroy a forest tile to locate something. And unless I have missed something, no one in the game tells you that this town is here. You just have to find the enclosed area suspicious enough to try everything imaginable to find it. Oh, and if you're attacked while you're cutting down trees, all the trees will be back when you finish the battle scene. Anyway, reveal the town and enter it. "We had to flee Kasuto." There is a barren town just south of the bridge I didn't have you cross earlier. The town is currently overrun with invisible monsters. We'll be going there later. "The old man who remains has magic." There is still one old man who lives in Old Kasuto. We'll be paying him a visit after we finish the next palace. "The hole in palace is an endless trap." While true, the hole is endless, saying it's a trap is not quite true. You can escape it at any time. Actually, it's necessary to use it to navigate the palace. "Call for help at the Three Eye Rocks." Call for help... or maybe blow the Flute. Probably the latter. "There is a secret at the edge of town." There is, and we're going to make sure we find it! After the standing woman, an elderly Hylian in purple will exit the house behind her and tell you that you deserve their help. Enter the house and in the back room is the final Magic Container. Continue through the town to the next screen. A little past the woman who will heal you is a house with an open door. Go inside and enter the fireplace to find the wise man. He'll grant you Spell Magic, which is a borderline useless spell. In any case, we're getting ready to use it. Exit the house and then enter the final screen of the town. You'll find a big empty field with nothing in it. Stand in the center of the field and use your new Spell Magic and a tall stone construct will erupt from the ground. Enter it and inside you'll find the Magical Key! Really could have used this earlier. After collecting the Magic Container, the Spell Magic, and the Magical Key, you're done in Kasuto. Head back out of town and go back through the cave, then head south. On the right side of the lake, position yourself in the center tile row between the far right side of the lake and the mountain and walk south. You'll find a hidden grotto with a red Geru and a 500 point P-Bag in it. Continue heading south to the shore, then hug the shoreline and make your way east and you'll find the final Heart Container along the shoreline in a hidden area. Now that you have every Magic Container and every Heart Container, it's time to enter the final palace before heading off to the Great Palace. Walk west across the sand and you'll find three stones in the center of the desert. Position Link in between the two stones that are side by side and press B to blow the Flute. The Three Eye Rock Palace will appear before you! This palace is tough and relies very heavily on the use of magic. There are at least two times where you're going to have to use magic to proceed through it, so be sure you're monitoring your magic levels at all times. It's also the final palace before going off to the last part of the game, so get ready! Only the Great Palace remains after this. My stats when entering the Three Eye Rock Palace were Attack 7, Magic 8, and Life 8. At this point I could have had my stats maxed out had I done a bit more grinding in the previous palace, but it's okay. There are many tough enemies in this palace that give plenty of experience, plus there's the free level gain from beating the palace. As usual, strike the Iron Knuckle statue in the beginning for a red magic decanter or a red Iron Knuckle, then head down the elevator. When you make it down you'll see a P-Bag to the right. Use your Jump Magic and break the ceiling to retrieve the 100 point bag, then hop down and go left across the elevator and into the next room. Immediately you'll see a blue Parutamu and a Moa flying around. Take them both out, making sure to not come in contact with the Moa. About halfway across the room is a P-Bag by the floor. Chop a staircase down to it and grab it, then continue left through the room to kill another Parutamu who is waiting on the stairs. Once you've defeated him, walk back to the elevator and take it down. Unlock the door with your Magical Key and two Wizzars will phase in in front of you. Reflect Magic them and then proceed a bit more and you'll find a Doomknocker. In the next screen, a blue Iron Knuckle will come out at you. You can easily rush him and have him retreat to the point of falling off the ledge, but then you won't get any experience from him. Do your best to kill him, but if he falls, don't sweat it too much. Use Jump Magic and leap over the pit to the other side. The Iron Knuckle statue will give you a red magic decanter or spawn a red Iron Knuckle. Unlock the door and exit into the next room. Up next is a room full of Wizzars and fireball spitting statue heads along the walls. It shouldn't take too long to defeat the three Wizzars. In the next room you'll have a fast moving Bubble and a blue Iron Knuckle to deal with. Take out the Bubble first because if it ends up in the narrow corridor with you while you're trying to defeat the Iron Knuckle it's not going to be good. Behind the blue Iron Knuckle is a 100 point P-Bag. Make your way up and to the right, then jump over the gap where the Doomknocker is. 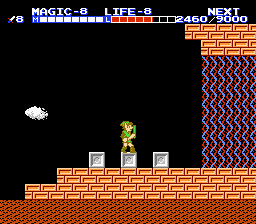 Like the third palace, you can make this jump without using Jump Magic, but you have to be pixel perfect with your jump. Here you have an annoying trap which will catch you off guard if you're not careful. It's tempting to kill the Moa, but it can actually be helpful. Between the third and fourth Iron Knuckle statues is a hole in the ground you'll fall through if you try to walk on it. If you watch the Moa's fire drops, they'll pass through the floor in the false part. View the image to the left to see exactly where the hole is. I have grayed the false floor out so you know where it is and exactly how big it is. Another way to tell where it is is to check the top brick on the floor past the statue. The first two bricks are safe, but the third brick is false. You will need to use Jump Magic to safely clear the gap. The Iron Knuckle statue to the right of the hole holds a red magic decanter or a red Iron Knuckle as well. Chop through the wall to the right and enter the next room. 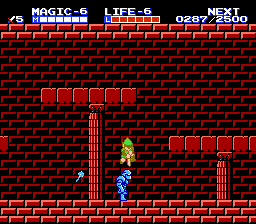 When you enter the center of the next room, the boss music will kick in, however this isn't the boss of the palace. You'll have another encounter with Rebonack here, but he's a pushover at this point. If your attack stat is high enough it's possible to kill him before his horse even leaves the room when he dismounts. 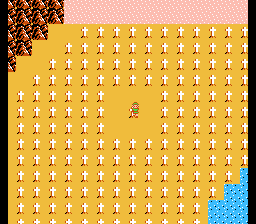 Once you defeat the once mighty knight, continue a bit more to the right and you'll find the Cross, the final item in the game and the item which lets you see invisible foes. Sounds more useful than it really is. Once you have it, head back left into the previous room. It's okay to fall into the false floor at this point. After falling, jump the wall to the right to find a red Iron Knuckle and a 200 point P-Bag. Collect it then go left across the room and into the next where two blue Paratamus and three Wizzars await. Take the elevator up and you'll be in the hole with the Doomknocker you jumped over earlier. Get out of the hole and make your way left across this screen and the next until you get to the big hole you jumped over. This time, fall into it towards the center. You'll land on a disintegrating bridge. Hop across it to the left and you'll find a 200 point P-Bag and a blue Iron Knuckle. After getting the experience, use what's left of the bridge to jump over to the right side to fight another blue Iron Knuckle. You'll probably have to use Jump Magic to make the jumps. Afterwards, fall in the hole on the right side and hold right. Use your Magical Key on the door and engage the blue Iron Knuckle. Push him too far back and he'll fall off the screen, and nobody wants that. Up next is a dangerous room with swooping Ra heads and pits of lava. Mind your footing and expect their patterns and you should make it though the room without issue. Two Wizzars and a red Iron Knuckle are in the next room. By this point you can probably kill a red Iron Knuckle in one strike. In the next room is a vast pit of lava with fast moving Bubbles swarming it. You'll have to use Fairy Magic to traverse the pit. Be sure you avoid the Bubbles. While they don't do much damage, they do drain your magic if they hit you, and you're going to need to use Fairy Magic again very soon. Head across the next room and go right past the elevator. Hopefully you won't have to use that elevator because if you do it means you messed up. 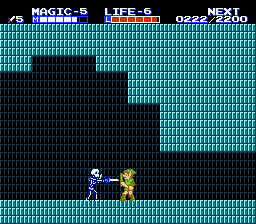 Head right into the next room and the boss music will begin again, and like before, this isn't the boss fight. Rebonack is back one final time. Is it the same Rebonack each time back for revenge or is it a different one? Mysterious. Defeat him as usual and then proceed right into the next room. Here you'll see a pit with a small disintegrating bridge in it. On the opposite side is a blue Iron Knuckle and a 1-Up Doll. If you have enough magic to spare, and you'll need a decent amount, you might as well use a bit of it and cast Jump Magic to easily make it over to the other side. Before you fall into the hole, press start and highlight Fairy Magic, but don't cast it yet. Fall into the hole, and when you come out on the other side, hammer on the select button to cast it. If you have enough magic, perfect. Fly towards the right through the opening and into the next room. If you don't, then things just got a little more tricky. If you fell into the next screen without using the magic, you'll land on a long disintegrating bridge with a lot of Bubbles bouncing around. Run to the right across the bridge, strike the Iron Knuckle statue, and pray that it drops a red magic decanter and not a red Iron Knuckle. If it drops the decanter, you're all set. If not, then the only option you might have to get your magic refilled is death. Unless some enemy down here is nice enough to drop a red magic decanter, you'll have to deliberately kill yourself. If you grabbed the 1-Up Doll earlier you're fine. Eventually you'll come to an elevator. Take it up and you'll see that it's the elevator you passed earlier. Now, if you were able to cast Fairy Magic, fly right and into the next room. You're about to have a boss fight for real. Barba, also called Volvagia around some parts, is a serpentine dragon who lives in the lava. Use Jump Magic, then position yourself on the right side of the center platform and continuously crouch and stab. Barba is likely to emerge from this opening first. When it does, you can get some hits in on it before it fully extends and breathes fire at you. If you're fast enough, you can jump and strike it again before it attacks. Try to not be on the platform next to it when he does. Barba can knock you backwards into the lava with its fire breathing attack. Additionally, Barba itself can damage you if you happen to be standing too close to the edge when it appears from the lava. It really isn't that difficult of a battle, and if you're feeling confident, you can more or less just aggro him to death and throw caution to the wind. I don't recommend doing that until you're very confident in your own abilities, though. In a thrilling display of fireworks, Barba will explode just the same as every other boss and a key will drop from the ceiling. Collect it, then carefully jump across the lava to the locked door. You don't want to fall in after you've killed the boss. Place the gem and then exit this place. Three Eye Rock Palace has just become Four Eye Rock Palace. After defeating the boss and exiting the palace, make a very short journey west and cross the bridge leading to the town. It's a dangerous broken bridge with Bago-Bagos on it and a Zora, so be careful when jumping the gaps or you could end up in the water. This is the town that the residents of Kasuto were forced to abandon. Enter the first house you come to and in the back is a wise man who will teach you Thunder Magic. This magic is necessary to finish the game, so be sure you get it. You can explore Old Kasuto if you'd like, but there is literally nothing here besides abandoned houses and purple Moas. Once you have had your fill of this awful place, exit town and cross the bridge again. Once you're across, head north just a bit and cross the bridge leading west. It's laid out exactly the same as the one you just crossed, so use the same caution you used before. And now, I present to you a question: Are you ready to finish the game? If the answer is yes, then we have one little thing to do before we make the long journey to the Great Palace. If you're playing on a console, now would be a great time to save your progress because we're going to go ahead and collect all the 1-Up Dolls on the overworld. If you'll recall, these do not respawn once collected, so you'd better be sure you're on your way to the end of the game before grabbing them. Consult the image below and position link where it shows to find every hidden 1-Up Doll on the overworld. Once you've collected them, head south through the small cemetery just past the valley after the River Devil. You'll have to go through another battle scene like the ones in the valley, only this one has an annoying Moa flying around. By now you should be max levels with 8 across the board, but if you're not, you'll probably get it relatively quickly on the way to the Great Palace or in the palace itself. It's a rough and extremely challenging journey to the final palace, but it's not difficult beyond belief. After you enter the lava area below the cemetery, cut east and step onto the tile in the inlet along the mountains to find a hidden grotto with a red magic decanter in it. Before collecting it, make sure your life is completely full. You're going to need all the magic you can get. After collecting it, head out and keep walking west. You'll probably be attacked along the way and have to do a battle scenario full of Moas and Girubokkus. When the path narrows, you'll enter a mandatory battle scene. Mandatory, unless you happen to get into a random encounter as you're stepping onto the tile. If you can time it just right, you can avoid these difficult battle scenes by getting into random encounters on top of them. Try it a few times but if you can't get the hang of it, then don't worry. If you do decide to go through the mandatory battle scene, cast Jump Magic when you enter and jump over the lava pit. There is an orange Geru on the other side that you'll have to deal with. Just past that is more lava, more Moas, and more Girubokkus. Make sure the Moas are out of the way before you start trying to take on the platforming part or you might end up getting knocked back into the lava. 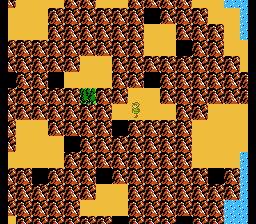 Once you make it past this part, there is another orange Geru and a big lava pit which is why I suggested castling Jump Magic. Once you get through this, you'll end up back on the overworld. This layout appears three more times on the way to the Great Palace, so if you find it exceptionally difficult, I highly suggest trying to bypass it using the method I described above. Continue north and you'll find another mandatory battle scene exactly like the one I just described. Once you clear it, continue north and enter the cave. The first room of the cave is filled with Moas and Girubokkus, which is nothing you can't handle. The next screen throws an Aruroda at you followed very closely by a blue Geru who throws his mace at you. This attack cannot be blocked by your shield, so watch out. When you exit the cave, follow the linear path south and around the wall north. You'll soon hit the third and final mandatory battle scene. It is exactly like the other two except this one has red Gerus in it instead of orange ones. When you get through it, enter the cave. This cave looks just like the one you just exited, and it is, except it has a red Geru in it as well and it doesn't have the room with the Moas and Girubokkus in it. Kill or run from the blue Geru, then take on the red Geru quickly if you avoided the blue one. In no time at all you'll be at the doorstep of the Great Palace. This is it. This is the final palace. As you approach the Binding Force at the palace gates, they will rise and allow you to enter. Take the elevator down and head left. You'll soon find a fierce new enemy named Fokkeru which shoots fireballs into the air in an arcing pattern. These fireballs turn into flames that scurry along the floor when they hit. Get close to it and slash it with your sword and it will go down after six hits or so. Climb the breakable stone stairs to the top level. You'll see some Bots below you, which looks suspicious. The floor directly left of the pillar you see below you is false, so when you're lined up with the pillar below, jump over the false floor. When you're on the other side, take the elevator down and then go right into the next room. You'll cross a long bridge over lava, but there are no enemies to worry about. In the next room you'll find a lone red Fokkeru and an elevator. Take the elevator down and then head right. You'll have to break through several breakable blocks in this room and avoid the swooping Ra heads which will fly in at you. In the next room you'll encounter the fiercest regular enemy in the game. As the room opens up, a fast moving bird knight named Fokka will come in at you. He has the same abilities as the blue Iron Knuckle, but he jumps, he's fast, and he's extremely aggressive. It's best to just avoid him by running past him and making your way through the rest of the room with him on your tail. Take the elevator down, then a little over halfway down, go left and you'll find a false wall you can go through. 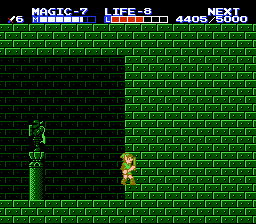 It ends up in a room with a Fokka statue that you'll have to use Jump Magic to get high enough to strike. If it spawns a red Fokka, leave the room and come back and strike it again until it drops a red magic decanter. Use this opportunity to use Life Magic and fill your life meter as much as possible, then collect the decanter. Continue taking the elevator down and you'll be in an identical elevator shaft, complete with false wall. 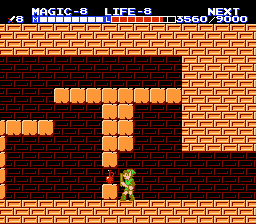 This room behind the false wall doesn't spawn anything from the Fokka statue, though. Continue taking the shaft down, then head right. The next room has fireball spitting Anerus in it. Their attacks cannot be blocked with your shield, so down thrust them as you go by them. Gold Ra heads will also swoop in at you, but overall the room isn't very threatening. Take the elevator down into the next room. Here you'll see a familiar room, only this time there's a blue Fokka in it. The best way to take him on is to chop your way up into the wall and position yourself where this image shows. Crouch on the edge and repeatedly stab and he'll keep jumping into your attacks and die without any problem. He's the only enemy in this room other than Bots, so once he's defeated you're clear to move on. Just be patient. You don't want to have to take this guy head on. Enter the next room and walk across the disintegrating bridge, being very wary of the fireball spitting Aneru stationed on it. Nothing a down thrust can't address. After this short room, take the elevator down and right. You'll see curtains at the top of the screen like you're getting ready to enter a boss battle, but they're just there for decoration. You will, however, have the enormous King Bubble floating around and another Fokkeru spitting fire everywhere. Ignore the King Bubble and take out the Fokkeru the same way you have been, then enter the next room and maybe get your Life Magic ready if you're a little low. When you get to where the room opens up, a blue Fokka will come at you, and he is far more threatening than the red one you saw earlier. Rush past him and he'll be on your tail, but you can outrun him. Taking him on is not recommended. Take the elevator down when you get to it. Here you have another elevator shaft with a false wall. Go into it and use the same tactic you used earlier to try to get a red magic decanter. Take the elevator down and head right towards the breakable stones. On the far right side of the room is a fairy which will completely refill your life. Be extremely cautious when trying to get to it because you can easily down thrust right through the floor and into the lava. Continue taking the elevator down and then head left into the next room. Here you'll have the always annoying Ra swooping in at you and some highly suspicious breakable stones along the floor. From the left, chop out either the 5th or 6th block and you'll fall through a false floor. Make your way right and when the room opens up prepare for a surprise. A huge King Bot will appear from up above you, so give it an up thrust and it will explode into several smaller Bots. It's nothing to worry about, just a little jarring and out of left field. Continue on into the next room. 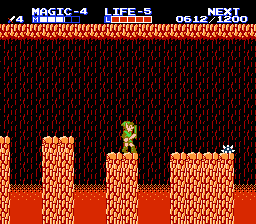 Cross the disintegrating bridge and you'll eventually come to a narrow gap in the lava flanked by two walls. Cross the bridge over it so you can get down to it, then jump down into the hole. You'll fall into a room that looks like the one that had the King Bot in it. When you land, go left and destroy the first set of blocks. There's a chance you'll find a red magic decanter here. There's also a chance you'll find a red Fokka. If you uncover a red Fokka, run like hell to the right. If luck was with you and it's a red magic decanter, go ahead and refill your life, then collect it. You're going to want to have as much life and magic as possible from this point forward. Head right into the next room when you're ready, and let me tell you, get ready. This is it. When Thunderbird appears, you won't be able to damage it when it's colored red. In order to damage it, use Thunder Magic to reveal its face, which will turn it blue and reveal its weak point. You should also have enough magic left over to cast Jump Magic and Shield Magic. You're going to need both. Thunderbird flies around the screen in random directions, constantly belching fireballs out at you. The fireballs spill from its mouth, which is where you're going to need to be in order to inflict any damage on it whatsoever. Thunderbird's body does not actually cause damage to you, so don't worry about coming in contact with it. Your main concern are the fireballs. Your attack level being as high as it is will help you greatly, and the best advice I have for this conflict is to be patient and look for your opportunities to strike. You can't come at it extremely aggressively. If you get caught up in the fireballs, it's easy to never recover from it. Even with Shield Magic, if you get hit with fireballs seven times you're done. I know that sounds like a lot, but until you see how many fireballs this thing spits out at you, you have no idea. With maxed out attack, it will take you eight strikes to defeat it. Do your best. Be patient. Hope you still have plenty of lives remaining after making your way through the Great Palace, because I can almost guarantee you will be killed by this boss at least once until you get the hang of it. Once the Thunderbird is defeated, a key will drop from the ceiling. Collect it, then head right. You have another boss fight to deal with. 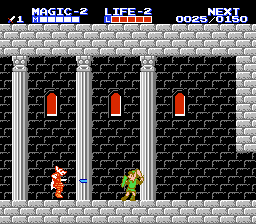 Everyone's favorite alternate version of Link makes its first appearance, and it's a pretty cool fight. When you enter the room, proceed to the battle arena and the Keeper of the Triforce will vanish and the lights will dim. Link's shadow will leap from his body and begin very aggressively attacking you. There's a cheap way to defeat Shadow Link which will most assuredly guarantee your success in fighting it. Position Link on the far left side of the screen with his back facing left and continually strike towards the room. Shadow Link will approach and do everything in its power to get behind you, and it might a few times, but your position will keep it from staying there very long. If your life gets low, by all means use Life Magic if you have enough magic to cast it. Using this technique will defeat Shadow Link in literally seconds. If you want to take him on in a more forward way, by all means. Think of it as the worst Iron Knuckle you've ever faced. Once Shadow Link is defeated, sit back and watch the ending and credits. You've just made it through a game many consider to be extremely difficult. But not you. Now you're playing with power! I hope this guide has helped someone conquer this game. 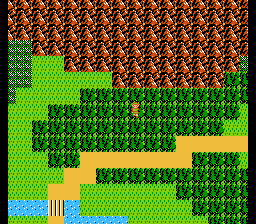 It was a lot of fun writing it and it's always fun playing through Zelda II again. I hope you enjoyed my guide!